You probably stumbled upon this article because pink is your favorite color! Who blames you? Pink is feminine, elegant, and a must-have color in your closet. 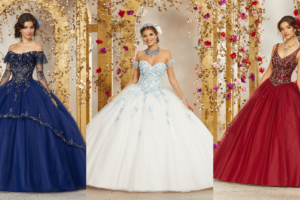 It’s also the most popular color among quinceaneras! Instead of combining pink with white, glam it up with another gorgeous color. Scroll away to discover the best pink color combinations for an out of this world Quinceanera celebration! Elegant & feminine are the words to describe pink & gray. Incorporate lace designs and satin bows to your reception tables & cake decor to complete the elegant look you’re going for. Click here to purchase dress for $1,450! Gold adds a royalty touch compared to gray, which is perfect if you envision yourself looking like a princess. Metallic and sparkly gold are a must in your decor and outfit! Your gorgeous cake should contain different textures in every layer. Make sure you light up some candles as table decor for a romantic environment. Click here to purchase for $758! Can’t decide between pink or purple for your color theme? How about combining them for the perfect color palette! Pink and purple are the ultimate girly colors that will liven up the reception space to the max. You could choose lavender or a multi-color dress to easily incorporate pink & purple to your quinceanera dress. Click here to purchase for $830! Mint green & pink is the hottest Spring color palette! Choose a two piece quinceanera dress with lace and a ruffled skirt to bring out the vintage theme. You can add gold and pearls to take your decor to the next level. If you’re looking for pops of color throughout the venue, you may want to consider pink & orange. These tropical colors are perfect for the Spring or Summer. Decorate your tables with an orange satin table cloth and pink bow perfectly wrapped around your chairs. Incorporate flamingos and hibiscus flowers to your venue decor for a playful touch. There are tons of multi-colored pink & orange dresses to choose from! Click here to view original image from Pinterest! Click here to view dresses by Morilee! Pink & orange are too bold for your tastes? Try pink & yellow, which is a more relaxing and toned-down color palette. Your can’t go wrong with stripes, polka dots, and chevron print decor. You can choose a pink or yellow dress. Just keep in mind that a yellow dress will make you stand out more than a pink dress because it is a less common color among quinceaneras. Darker tones rule your closet? Pink & navy were made just for you! Add stripes or lace to your cake, invitations, and bouquet to upscale the final look of the reception. Decorate your ceilings with lights and pom-poms. Trust us, your guests will be checking out the ballroom from floor to ceiling so you don’t want to forget about the minor details. Click here to purchase for $1000! Is light blue your favorite color? Pink & Tiffany blue are the cutest colors combined! Fresh flowers and satin bows will beautify the reception space. Your cake could be designed with flowers or the latest trend – marble! Featured image is property of House of Wu and Etsy!